Anticipatory Governance would be a systems-based approach for enabling governance to cope with accelerating, complex forms of change. 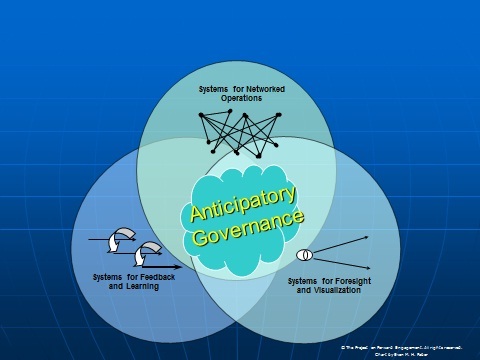 Anticipatory Governance is a “systems of systems” comprising a disciplined foresight-policy linkage, networked management and budgeting to mission, and feedback systems to monitor and adjust. Anticipatory Governance would register and track events that are just barely visible at the event-horizon; it would self-organize to deal with the unexpected and the discontinuous; and it would adjust rapidly to the interactions between our policies and our problems. Anticipatory Governance Practical Upgrades: Equipping the Executive Branch to cope with increasing speed and complexity of major challenges. Report by Leon Fuerth with Evan M. H. Faber published by National Defense University Press, October 2012. Article published in PRISM September 2011. 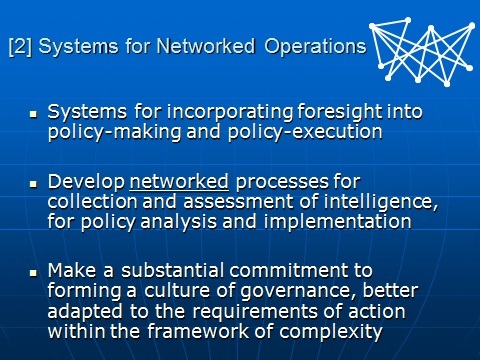 A series of workshops held at the National Defense University (NDU) from April 2011 – July 2011 convened experts from in and outside government to vet and validate and build upon Anticipatory Governance concepts. Participants were mostly from mid- to high- level positions in government, as well as former senior practitioners and some outside experts in subjects such as foresight and network theory. Consistent participation throughout the process came from individuals working at the NSS, DOS, OSD, JCS, DHS, ODNI, and GAO. All workshops operated under Chatham House Rules, meaning participants entered under agreement from all parties that the discussion would be private, comments would not be attributed to individual persons, and it would be assumed that each participant spoke for themselves personally, rather than for any institution. The workshops stress- tested designs for anticipatory governance against a strict set of criteria: they must be very light on resources; executable using existing Presidential authorities and compatible with existing White House processes. 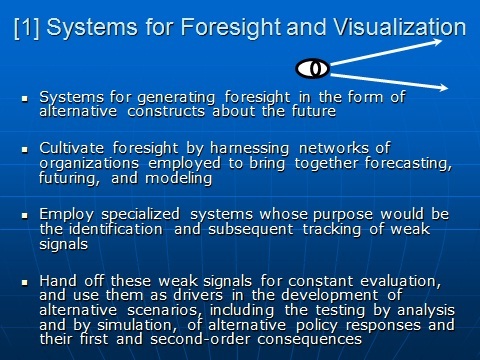 They must also be compatible with longer-range, more profound reform involving the Executive Branch as a whole, if and when that becomes possible, and they should be integrated with advanced methodological approaches to foresight and systems operation.